From slowing the decline in brain functioning, to generating a sense of oneness with one another and the universe, drumming’s physical and spiritual health benefits may be as old as time itself. 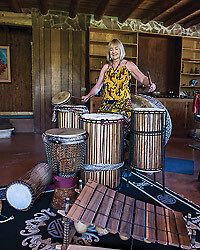 To understand the transformative power of drumming you really must experience it, which is something I have had the great pleasure of doing since becoming a music therapist in 1987. Some of you may remember when I started the first Taiko drumming group here in 1994. For the last 12 + years, I’ve focused more on West African drumming, playing with the Arizona Dunun Ensemble, the Africa Heartwood Project, and Quinn Ressor in weekly African Dance classes at Rose Wagner in SLC. Though my sound studio is full of drums (available for those who don’t have one yet), there is still space enough for those who desire to join me in learning these transformational African rhythms and songs. Drumming is not a distinctively human technology. The use of percussion as a form of musicality, communication, and social organization, is believed to stretch as far back as 8 million years ago to the last common ancestor of gorillas, chimpanzees and humans living somewhere in the forests of Africa. Interestingly, percussive sound-making (drumming) can be observed in certain species of birds, rodents and insects. Of course, we all know about the woodpecker’s characteristic pecking, but did you know that mice often drum with their feet in particular locations within their burrow, both for territorial displays and to sound alarms against predators? Did you know that termites use vibrational drumming signals to communicate within the hive? Even more amazing is the fact that wasps appear to use antennal drumming to alter the caste development or phenotype of their larvae. Getting back to us two-legged humans . . . There is some compelling evidence from human clinical and observational studies on the power of drumming to affect positive change both physically and psychologically. 1. Reduces Blood Pressure, Anxiety/Stress. Conclusions from a 2014 study published in the Journal of Cardiovascular Medicine showed a reduction in blood pressure, blood lactate and stress and anxiety levels in both middle-aged experienced drummers and a younger novice group after a 40-minute djembe drumming session. A 2014 study published in the Journal of Huntington’s Disease found that two months of drumming intervention in Huntington’s patients (considered an irreversible, lethal neurodegenerative disease) resulted in improvements in executive functioning and changes in white matter microstructure, most notably in across the corpus callosum, the part of the brain that connects the left and right hemispheres. A 2012 study published in Evolutionary Psychology found that active performance of music (singing, dancing and drumming) triggered endorphin release, whereas merely listening to music did not. The researchers hypothesized that this may contribute to community bonding in activities involving dance and music-making. A 2001 study published in Alternative Therapies and Health Medicine found that drumming “increased dehydroepiandrosterone-to-cortisol ratios, increased natural killer cell activity, and increased lymphokine-activated killer cell activity in the immune system. A 2004 study published in the journal Multiple Sclerosis revealed that drumming enables participants to go into deeper hypnotic states, and another 2014 study published in PLOS ONE found that when combined with shamanistic instruction, drumming enables participants to experience decreased heartrate and dreamlike experiences consistent with transcendental experiences. A powerful 2001 study published in the journal Evidence-Based Complementary and Alternative Medicine found that low-income children who enrolled in a 12-week group drumming intervention experienced improvement across multiple domains of social-emotional behavior to include anxiety, attention, oppositional and post-traumatic stress disorders. New to drumming and want to try it? Call Annette to find out about group or individual instruction. Remember that inside all of us are rhythms waiting to be expressed. Bottom line is DRUMMING IS FUN!! I hope that you landed on this page because you have been inspired to become a trail runner! Before we get too excited, there are a few things that must be in check before venturing off on your first trail run. Below is a basic guide to starting out. You’ll probably outgrow this guide after your first couple months on the trails. Nevertheless, get off to a good start, and make this a lifetime passion of yours! Go to a local running store and try on several trail running shoes until you find a pair that feels comfortable. Most stores have a wall dedicated to trail running shoes. I am partial to Altra, because they feel the best on my feet. However, they are a zero drop shoe, meaning that if you have tight calfs and a shortened Achilles tendon, they can take a while to adjust to. Also, beware that you can end up with Achilles or plantar fascia pain if you transition to a zero drop shoe too quickly. Look for a trail shoe with a rock plate, which will protect the soles of your feet from sharp rocks. Most trail running shoes these days have rock plates. If you have medical grade or custom orthotics make sure you bring them with you. If they don’t fit into any of the shoes you try, don’t let that me the determining factor for not picking out the shoe that feels best. There are several over-the-counter orthotics that fit well in running shoes. Additionally, consider a custom orthotic specific for running. Keep your first trail run around 30 minutes (or roughly 2.5-3 miles), and at a conversational pace. Your trail pace will always be slower than your road pace. There are times when I’m running 9-10 min/mile pace on an uphill trail, and I feel like I’m going hard. Whereas, 6 min/mile pace might feel easy on a flat road. You will find that you will be able to progress quite quickly as your fitness improves. All you need right now is a good pair of shoes, shorts, sport’s bra, and a t-shirt (optional on a hot summer day). Skip the hydration packs and other gimmicky items. A lot of trail runners just like to “look the part”, but in reality, they look ridiculous running with all their pricy survival gear on these local trails! Once you start progressing to 90 min runs, I’ll suggest carrying a water bottle. If you start running for 2+ hours, then might want to look into some of the “survival gear”. Just start at an easy pace. You should feel like you are “shuffling” for the first 5-6 minutes. Some runners have a warm-up routine. Often times, this is for those who are rehabbing an injury. If you have a warm-up routine that you are currently using for some other injury (i.e knee, hip) make sure you incorporate that into your warm up. Otherwise, just start slow, and find your flow. Augment your training with hikes! The steeper the better. Steep hikes are “leg day” in disguise. Think hundreds of box steps ups over a few beautiful miles of trail. Use these hikes as a way to build endurance. Expect to be sore the next day. Watch your footing. Bring water and snacks! Final Kick Ankle & Foot Clinic makes regular visits to meet with clients in Moab in the Moab Regional Specialty Center at 476 Williams Way, Suite B. Dr. Sekulic visits Moab every other Monday. Call for your appointment at 385-770-7203. Utah State University Moab’s first nursing cohort to complete the program completely in Moab will graduate in April. Three students will graduate, two of whom have already accepted local nursing jobs, and the third will be pursuing more training and education to become a nurse practitioner. Previous to this group, nursing students in Moab were required to travel to Blanding to complete lab and clinical portions of the coursework at USU Blanding. Partnering with USU Blanding allowed the program to start in Moab, and their support over many years was essential in establishing the nursing program in Moab. To expand the program in Moab, the USU Moab added new lab facilities and is working with local healthcare partners to provide clinical experience to the students. Dr. Steve Hawks, former Dean of USU Moab, worked with the University and the SWI Health Sciences grant to secure the needed funds and also began a network of local healthcare partners to work with Moab students. Moab Regional Hospital has been a long-time partner with USU Moab’s nursing program and supports the nursing students with a lab room at the hospital. Many other local organizations provided opportunities to the students to gain needed clinical hours and experience. This year, nursing students were placed with the Canyonlands Care Center, Four Corners Mental Health, Interact Club, Helen M. Knight Elementary School, and local hospice and urgent care centers. “We are so proud of our students, and the support the Moab community and USU Moab have provided to the nursing program. Without all the support we’ve received we wouldn’t be able to offer the program 100% in Moab, so it’s been amazing to see everyone involved come together and make this happen.” said Nancy Chartier, coordinator for the nursing program at USU Moab. The new facilities contain an automated training mannequin that is able to mimic many health conditions and problems, along with hospital beds and all the needed medical equipment to provide proper training. New faculty were also hired to fully support the nursing degree. After the first three students graduate in April, seven more are working to graduate next spring next spring. An additional seven students were recently accepted into the program and will start in the fall. USU Moab is grateful to all the groups that have worked to make these additions possible, including the local health care providers for welcoming the nursing students and providing the necessary hands on training experience, and to USU Blanding for supporting Moab students for many years and providing the means for the nursing program to start in Moab.